Global technology leader Laird (LRD: London) introduces two new, in-building, public safety antennas with industry leading frequency performance that ensure more reliable communications and greater connectivity for emergency responders. Radio communications can be unreliable inside large and small facilities, multi-floor and high-rise office buildings, apartment complexes and public venues. 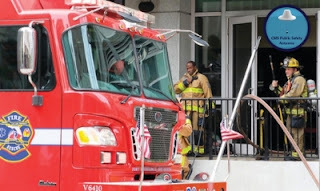 In-building structural, mechanical and electrical generated interference and the many obstructions encountered by emergency personnel moving through the building weakens two-way radio and wireless device signals causing communications to be dropped. A lack of reliable communication can be dangerous for emergency responders like police, paramedics and firefighters, as well as for the building occupants they are trying to help. To ensure consistent, highly reliable emergency voice & data radio coverage inside buildings, Laird engineers have designed a range of new antennas for a Distributed Antenna System (DAS). The Canonical Minimum Scattering (CMS) Standard and CMS Low Passive Intermodulation (PIM) Omnidirectional DAS Antennas deliver superior wide band performance across the 380-960 MHz and 1395-6000 MHz bands including the Advanced Wireless Services (AWS-3) band and LTE 600 MHz band. All of this from one aesthetically pleasing and compact housing built for highly reliable operation in extremely harsh conditions. "Covering more frequencies within a single antenna means more reliable communications between more types of wireless devices. And reliable communication for all of those radios increases the potential to save more lives," explains Jack Cowper, Laird's Senior Vice President of Infrastructure Antenna Systems. "The safety and security of building occupants and emergency first responders who serve and protect our lives and property is of the upmost importance. The CMS line of Public Safety DAS Antennas deliver superior performance, and provide a highly reliable extension of in building emergency wireless communications in the most extreme operating environments," says Cowper. Both antennas are IP67 rated for dirt and dust intrusion and temporary water immersion making them ideal for highly reliable operation in harsh indoor and outdoor conditions. Compliant with in-building International Fire Code (IFC) & National Fire Protection Association (NFPA) regulations the CMS Standard and Low PIM antennas support applications including multi-floor and high rise office buildings, industrial and apartment complexes and public venues. The CMS Public Safety DAS antennas come standard with an industry leading five (5) year materials and workmanship product warranty. You can learn more at http://www.lairdtech.com/products/cms38606. Laird is a global technology company focused on providing systems, components and solutions that protect electronics from electromagnetic interference and heat, and that enable connectivity in mission critical systems through wireless applications and antenna systems. Products are supplied to all sectors of the electronics industry including the Automotive, Mobile Device, Healthcare/ Medical, Computer/ Gaming, Telecommunications, Industrial/ Production, and Transportation markets. Laird, a unit of Laird PLC, employs over 9,000 employees in more than 50 facilities located in 19 countries. 0 comments on "Laird's newest public safety antennas can increase wireless connectivity and radio communication coverage for emergency responders"